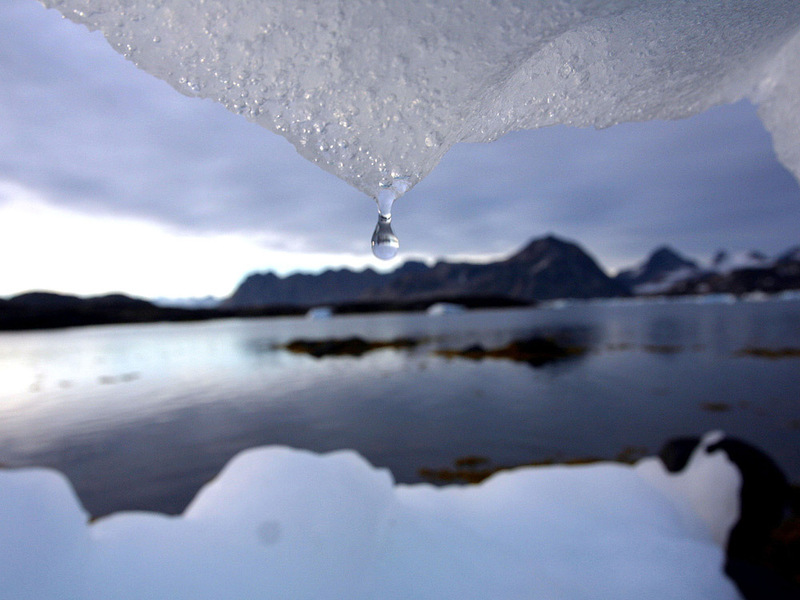 For Public, Climate Change Not A Priority Issue Despite the attention being paid to the Copenhagen climate talks beginning Monday, public opinion of the urgency of climate change continues to sink. Some social scientists say the issue is so daunting, many people decide to shut it out of their thoughts. Will this affect a climate change treaty? An iceberg melts in Kulusuk, Greenland, near the Arctic Circle in this 2005 photo. Skepticism over global warming has been growing, and according to a recent Harris Poll, barely half of the American public believes that the carbon dioxide building up in the atmosphere could warm our planet. Nearly 100 world leaders are expected to appear at the global warming talks that open Monday in Copenhagen. This is an unprecedented showing of leadership for the issue. Yet at the same time, public opinion of climate change is souring — particularly in the United States. A recent Harris Poll, among the latest of several over the past year, shows that barely half of the American public believes that the carbon dioxide that's building up in the atmosphere could warm up our planet. There are multiple reasons for this growing skepticism, including psychological reactions and politics. Anthony Leiserowitz of the Yale University School of Forestry puts one reason above all the rest: "First of all, it's the economy, stupid." People can only worry about so many issues at one time, he says. So it's no surprise they worry about issues that hit closest to home. "And the economy is still by far the No. 1 concern of Americans, which just pushes all other issues off the table." In a poll by the Pew Research Center for the People & the Press, climate comes in dead last, No. 20 of the 20 big issues of concern to America. But that doesn't completely explain why a number of recent polls show that people are less and less likely to accept the science of global warming. Here's where psychology comes in. "We just don't want to know about it, so we are actively distancing ourselves from it or trying to protect ourselves from it." That implies that some of the swing in public opinion can actually be explained as a reaction to growing public awareness of the issue, like Al Gore's movie An Inconvenient Truth, or the 2007 United Nations science report. But psychology isn't the whole answer, either. Leiserowitz's opinion research shows that there's a relatively small but active group of people who have decided that climate change is a phony issue. "The people who are pretty skeptical about whether this is even an issue to worry about, they're pretty mobilized right now," he says, "and they're amplifying their message across the country." Right now, they're having a field day with the e-mails stolen from climate scientists. Skeptics have taken some suspicious-sounding statements in those e-mails as proof that climate change is a hoax. That's certainly not the view of mainstream scientists, but again, the public doesn't necessarily listen to scientists. People trying to stir up doubt about climate change aren't working in a vacuum, says Tim Wirth, a former Democratic senator who now runs the United Nations Foundation. There's a large and well-funded effort to block legislation that could hurt the industries most responsible for carbon emissions. "Where does that money come from?" he asks. "Well, it comes in part, sometimes in large part, from the very industries whose ox is going to get gored if there's aggressive climate legislation. So that gets increasingly difficult on Capitol Hill." The ultimate question is: How important is public opinion in the fight over climate change legislation? "I don't think any place in the world would you find the public demanding [climate legislation]. I think it's very hard to see the public demand anything. That's very rare," Wirth says. What does matter is the influence of the naysayers. And they don't need a majority voice to make a big difference. So proponents of action on climate change — both on Capitol Hill and in the White House — have tried to build public support for climate issues by actually not talking about global warming. Instead, they are framing their actions in terms of green jobs and energy security. Leiserowitz says that's a good strategy. He's found that the public is leery of regulations to control global warming. But, he adds, "When you ask a question like, 'Would you support a system that supports rebates for solar panels or people who buy fuel-efficient cars,' everybody likes that idea." Questions like that get positive responses in the 90 percent range, he says. "That's a higher [percentage] than likes apple pie, or their own mother, probably," he said, only half-kidding. So the question ultimately may not hinge on whether the public is deeply concerned about global warming, but how expensive and disruptive it turns out to be to address it.